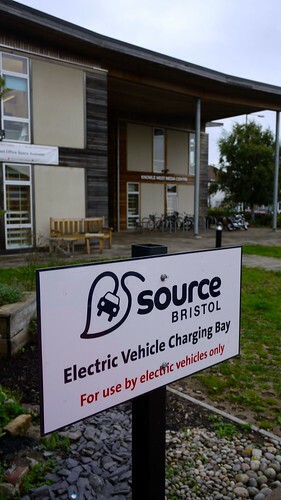 Fresh off the Manchester train, the first stop and a great introduction to Bristol is naturally the Centre for Sustainable Energy (CSE), an organisation originally formed in 1979 as an urban counterpart to the Centre for Alternative Energy. With a staff of fifty, CSE is now both a delivery agency for low carbon activity in Bristol and the South West and a policy and research organisation working around the UK. Ian Preston introduced some of CSE’s research and policy work. Of particular interest to me was a report on the increasingly troubled Green Deal programme that he’s been compiling for UK Energy (effectively the ‘Big Six’). Ian also outlined new policy changes around fuel poverty definitions with it now roughly classified as relating to people on below average incomes with above average bills (apparently the Queen was erroneously classified as fuel poor under the old definition). Project manager Mike McClelland outlined CSE’s work locally around the new ECO (Energy Company Obligation) – a form of funding energy efficiency measures on some ‘hard to treat’ properties, made available by the ‘Big 6′ energy companies. 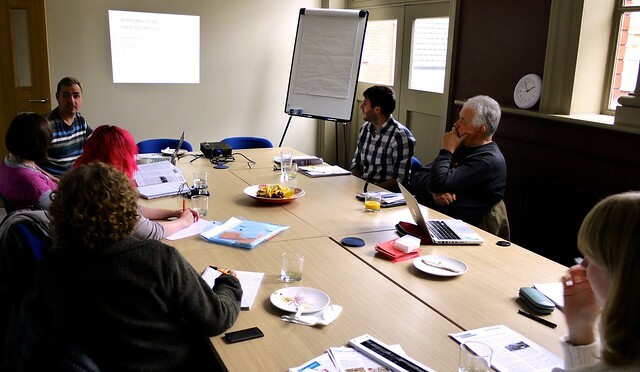 CSE have been delivering a project in Bath and North East Somerset, examining how community voluntary sector groups might work to deliver the scheme. Groups recruited householders with hard to treat properties who were assisted to install improvements such as solid wall insulation and boiler upgrades. The groups received a fee for successful referrals and technical issues were dealt with via the CSE advice line phone number. A key issue raised during the project related to the technical detail the groups were required to master in their communications with householders though the CSE advice line provided a good back up resource. Three packed hours with CSE and we’re in a taxi across town to Knowle West Media (KWMC) centre, a great example of a a regen-era new-build community centre that demonstrates excellent sustainability credentials not only in its building but also in the projects it delivers. Built in 2007, the building features a wood chip biomass boiler and solar hot water panels. These have since been complimented by a 25KW solar electricity PV array with the installation owned and funded by Bristol Energy Co-op. KWMC receive free power up to an agreed threshold with income generated through feed in tariff going to Bristol Energy Co-op (more details below). 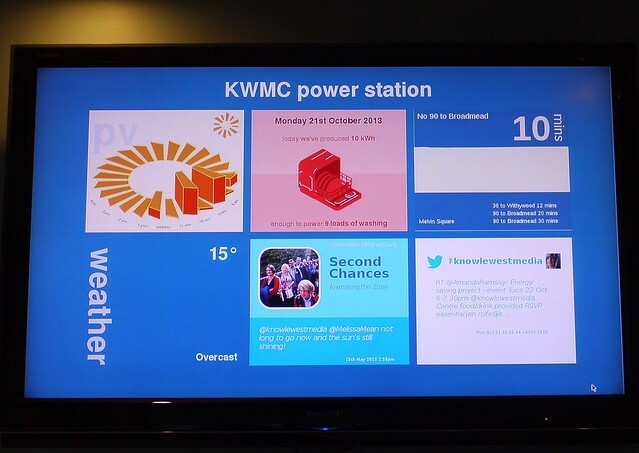 KWMC are pioneering a number of community-based, digital inclusion projects that encourage householder engagement in energy efficiency and low carbon technologies. They’ve been involved in DEHMS (Digital Environment Home Energy Management), a European project (also been delivered in Manchester) which saw householders given web enabled electricity monitors to evaluate the benefits on an online energy dashboard. Though a useful tool, it seemed KWMC has experienced similar frustrations to Carbon Co-op of using ‘black box’ proprietary equipment – the reason we now use OpenEnergyMonitors. Of greater interest was the SoLa project. One of the drawbacks of domestic solar panels is that the low voltage DC power they produce needs to be converted to 240V AC before being used in the home or exported to the grid – with a consequent loss of efficiency. The SoLa project seeks to overcome this by installing solar panels with battery stores and new household DC networks to power appliances such as LED lights, laptops and phone chargers. Bristol Council, Western Power Distribution, Siemens, Bath University are involved in the project and 30 homes plus a school and community centre will receive free installations and upgrades. 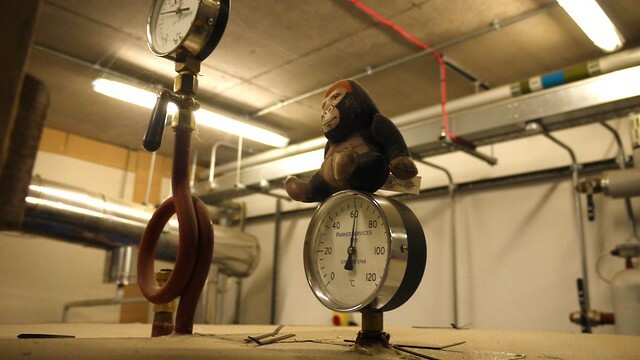 The results will be fascinating but even with just the first two installations carried out it is apparent that such an innovative project will face significant technical challenges. Our visit complete it’s a rush hour locked taxi ride back in to Bristol centre and an end to day 1. Day 2 starts at Bristol Council’s City Hall, an impressive 1930s curving building complete with original wood paneled lifts – sadly no operators now though. At a time when many local authorities are attempting to grapple with the opportunities and challenges of Green Deal, Bristol Council have been developing their own offer, helped by £2.5m grant from European Investment Bank’s European Local Energy Assistance (ELENA) which resources a good sized team headed by technical project manager Dave White. Kate Watson was also there, MD of Bristol Green Doors CIC who Bristol Council have worked with and supported in the past. The Council have been a useful player in the city’s wider low carbon development. 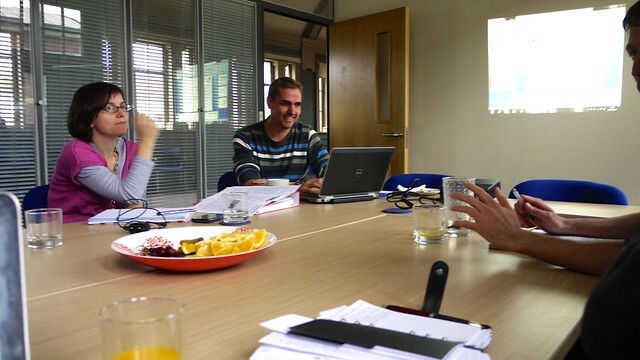 Engagement with the Bristol Energy Network, a community-based forum, has seen the creation of a community energy strategy for the area which was launched with the assistance of the elected mayor in June 2013. The Council are investing heavily in solar, they are slated to be the UK’s first solar city, with installations planned on their own residential and office properties and a solar map to encourage wider adoption. Plans are also in the pipeline for a council owned ESCo (energy services company) that would enable the local authority to sell energy generated direct to consumers. On Green Deal, Bristol are tendering out delivery and looking to develop the referral model for community organisations, with groups playing an early stage role in screening households and passing on leads but works ultimately being delivered by Green Deal providers. 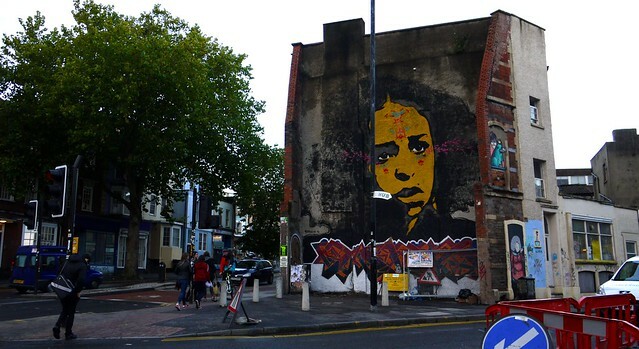 Of the local authorities I’ve visited, Bristol are one of the most active in trying to innovate new approaches to make the most of the community infrastructure they have in the city – Green Deal is by no means perfect and they acknowledge the participation of local organisations is key to the successful take off of whole house retrofit. Whilst we’re there, Kate Watson gives us a run down of the excellent Bristol Green Doors, a network of householders with energy efficient improvements who throw their doors open to the general public for regular open days. Suitably informed of the wider context we travel to Hamilton House in Stokes Croft to see Bristol Power Co-op’s community solar installation. 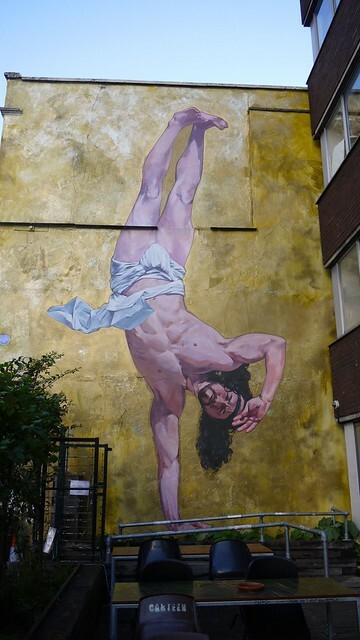 It’s no exaggeration to say Hamilton House is Bristol’s Hipster Central, it features an original Banksy a few yards down the road and outside there’s a 50 ft high mural of Jesus break dancing. 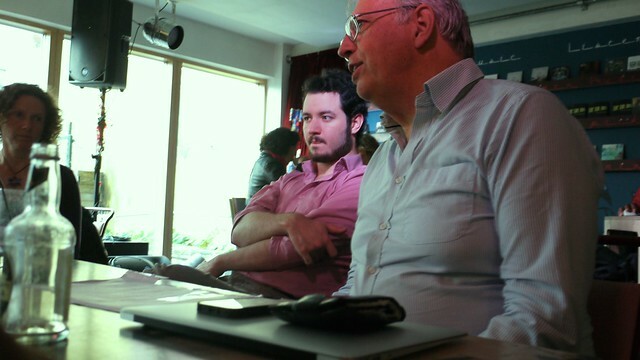 The building features a lively cafe bar, with an exceptionally high head count of MacBooks per seated customer, where we meet David and Gethen of Bristol Power Co-op. The co-operative have ambitious plans to role out a community owned (by householders and investors) residential roof rental scheme across the city. The panels will be financed through a share issue and loans and owned by the co-op and the householder will benefit from the free electricity generated by the panels. Membership of the co-op is open to householders who host the panels and investors but David and Gethen are clearly the driving force behind the enterprise. Overall it’s a risky strategy as cuts to the feed in tariff and a lower multi-installation rates have reduced potential income streams but the co-op are seeking to benefit from the discounted bulk purchasing of panels and low cost finance. Our final stop on the tour was mercifully in a pub but this being Bristol not your ordinary pub. This is ‘Yurt Lush‘, a bar in a traditional Mongolian tent – handily situated next to an Insect Circus – very Bristol! We meet Mark, Eric and Gery of ‘the other energy co-op’ in the city, Bristol Energy Co-op – yes Bristol is a city with not one but two energy co-ops! But their development and offer is separate and distinct from the Power Co-op focusing on co-ordinating the action of 25-30 volunteers across the city and delivering a small number of large solar installations on community centre roofs. Having already run a successful share issue offering 4% return and raising £120,000, the co-op have three community building installations (including the one at Knowle West Media Centre) under their belt. The co-op own the panels and benefit from feed in tariff payments with the centres receiving access to the free electricity generated. They plan to increase this with the next share issue for £220,000 whilst delivering a further three installations but their ambition is to partner on a couple of very large wind turbines on the edge of the city which would dwarf their current projects in scale and returns. It’s an interesting model and potentially very powerful if they can maintain momentum and keep the dispersed and entirely volunteer workforce resourced and focused. The evening ended with a discussion on the ‘Bristol scene’, its rich ecosystem with opportunities for collaboration but challenges of co-ordination. With a few drinks behind us and plenty of information and learning to digest, we stumble in to the station and on to the Virgin Express back North. The first thing that strikes an outsider is the incredible infrastructure that exists in Bristol for low carbon and sustainability projects. There are support agencies like CSE, pioneering co-ops and engaged community centres as well as a wealth of small scale neighbourhood transition and environmental groups. Bristol Energy Network (BEN) has been an important forum for groups and individuals to co-ordinate and share resources with each other and the new Bristol Community Energy Strategy authored by BEN starts to make the case for greater community delivery of larger scale projects. This grassroots activity coincides with political buy-in right to the top. The elected mayor may not be a hippy but he is a former architect with excellent sustainability credentials. Despite this infrastructure, the community, voluntary and co-operative organisations in the city still struggle to evolve (financially) sustainable models. Bristol Energy Co-op are 100% voluntary and looking for bigger projects to resource their organisation and ensure the momentum required to keep volunteers engaged and active. Bristol Power Co-op are highly ambitious but by their own admission still learning and carrying the debts of start up. Everywhere we went people proclaimed the ‘fabric first’ message, ‘solar panels shouldn’t be the first step, we need to reduce demand and tackle fuel poverty through energy efficiency and retrofit’. But for community and voluntary organisations retrofit is a harder nut to crack than renewables. The sheer level of technical complexity required for meaningful energy savings and concerns around misleading householders, make energy efficiency extremely challenging to roll out (barriers equally common in the private sectors it must be noted!). The unfortunate consequence of this is that undue faith is being placed in Green Deal/ECO in successfully delivering energy efficiency – something which is simply not happening at the moment. Furthermore, community organisations are being positioned at the front end of Green Deal but without any control or significant benefit. These groups are being shoved out front to bridge the gap in consumer confidence and trust in Green Deal but the resources generated through energy savings inevitably end up in the hands of Green Deal providers – eg energy companies, large contractors and multinational companies. This is exactly the issue Carbon Co-op is attempting to solve, pioneering Community Green Deal, a model for householder owned delivery of retrofit, something we’re keen to share with the groups in Bristol, and it’s heartening to talk to people like David White at Bristol Council who are innovating new ways to support and broker the community-led delivery of Green Deal with adequate levels of ECO funding that can support this. The Greater Manchester context is different to Bristol, for a start we get less sun but there are also different demographics and a different political landscape. Networks such as Fuelling Manchester do demonstrate a widespread interest and engagement in community sustainability (in fact we are now planning a Greater Manchester Community Energy strategy) and we can proudly point to projects such as Stockport and Torrs Hydro, Tree Station and Unicorn Grocery’s solar PV array. It was a really useful study visit and we learnt so much that we can be applied to Greater Manchester but in the end it didn’t feel like Bristol was an eco-utopia beyond reach and, in some areas, it seemed Manchester was actually ahead of the game.